This is my eighth image submission for Black and White Wednesday event #84, 22nd May, 2013. Simona from Briciole is hosting the Event. Susan, author of TheWell Seasoned Cook is a founder of this event. Now Cinzia of Cindystarblog is a new admin for Susan's Black and White Wednesday Event. For all guidelines and an index of all future event hosting blogs please check Cinzia's post here. Participants can join Flickr group created for B&W event. Next event (BWW #85, 29th May-2013) will be hosted by Priya of Humpty Dumpty Kitchen. This week I am submitting image of special power packed super food ladoos made with Chia seeds, Hemp hearts and fresh grated coconut. Ladoos are sweetened with honey and little brown sugar, no oil or ghee is used but it contains natural coconut oil from fresh grated coconut. 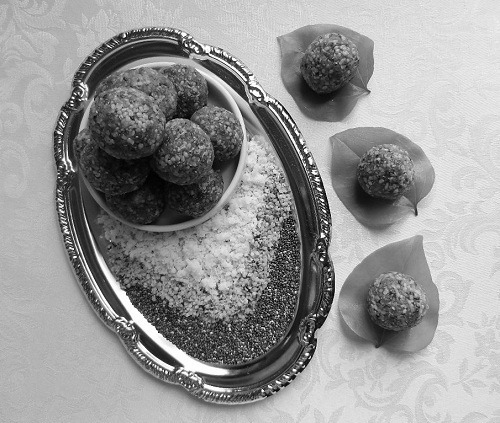 Ladoos are flavored with cardamom and nutmeg. This is the first time I have used Chia seeds and raw shelled Hemp seeds in cooking. These two versatile super foods can be very well used in Indian cooking. Chia seed, Hemp hearts and fresh coconut ladoos. Lovely image of a very interesting treat. I love the list of ingredients of your ladoos. Thank you so much for your contribution to BWW! Simona, Thanks for stopping by and hosting this weeks BWW event.All these interesting healthy ingredients made a very good sweet treat. sm, Thanks, ladoos were really tasty and packed with extra nutritious ingredients.